While plotting books is fun, and I enjoy the time playing, the most meaningful part of our time together is connecting and praying together. Every evening after dinner we go around the room and share our lives—what’s going well, what’s not going well, and our deep inner struggles. It’s a time of confession. It’s a time of rejoicing. It’s a time of peeling back the layers and being completely real. It’s a time of knowing that I am loved even as I share some of my biggest hang ups. I leave our retreat renewed, as if my soul has just been given a long shower with lots of scrubbing. It sounds wonderful, doesn’t it? Wouldn’t it be great to have more of those types of relationships? 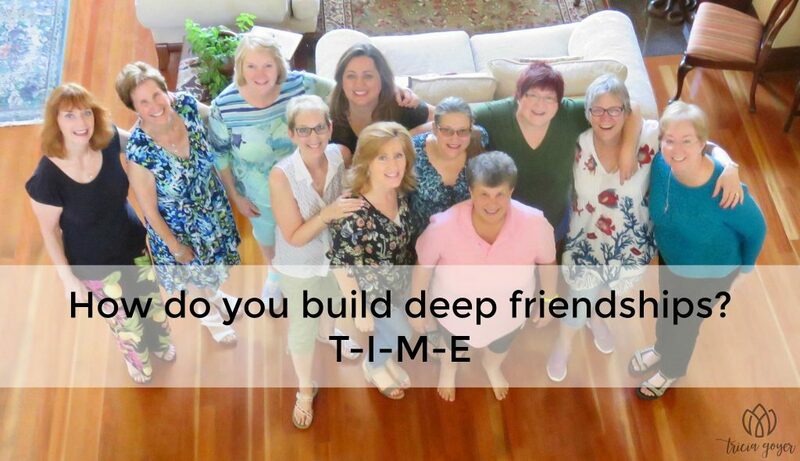 I agree it would, but the key to building those deep friendships comes down to one thing: T-I-M-E. We’ve been meeting together, praying together, and investing our hearts for fifteen years. In addition to our in-the-flesh retreats, we also have an email prayer group where we share everything from light-hearted moments to gut wrenching conflicts. But our ability to share with open hearts only came after years of being real and building trust. Our ability to share the deep things in 2017 only happened because we were able to share the not-so-deep things in 2003, 2007, and 2011 (and all the other years!). Isn’t that how things work in so many areas of our lives? We get out of it what we put into it. When I first started attending this novelist retreat I had no idea what it would become, but I’m thankful. It’s also a reminder to invest in others. The wonderful thing is, when I give of myself to other trusted friends I can experience other deep relationships too. Perhaps reading this message leaves an ache in your heart because you wish you had friendships like this. I encourage you today to just do one thing: reach out to another person today—someone you trust and want to get to know better. Then, reach out to her tomorrow and the next day. Take time to invest. In our lives we can get busy about so many things, but let’s not forget the people God’s placed around us. My life is different because of the friendships I’ve built, and I can see now that every moment given to drawing closer to trusted friends has been worth it.